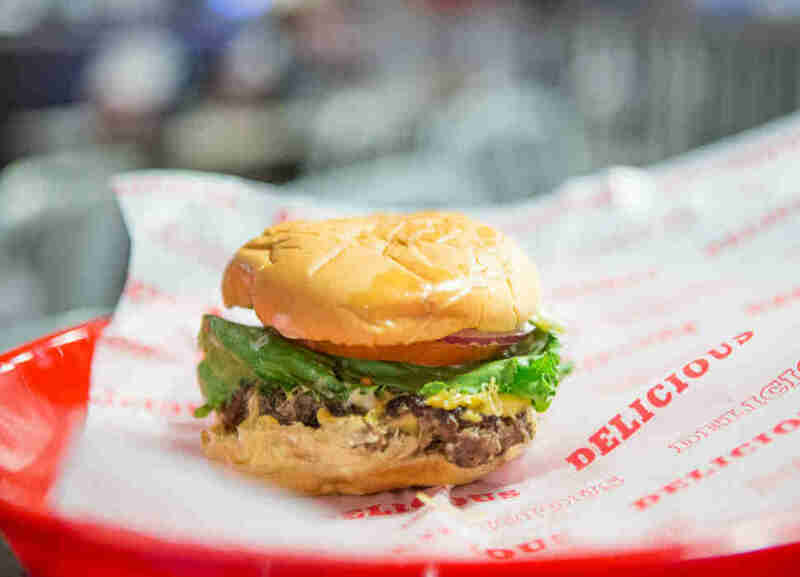 Editor's Note: This story is the 24th entry in Thrillist's Burger Quest, Kevin Alexander's yearlong mission to find America's best cheeseburger. 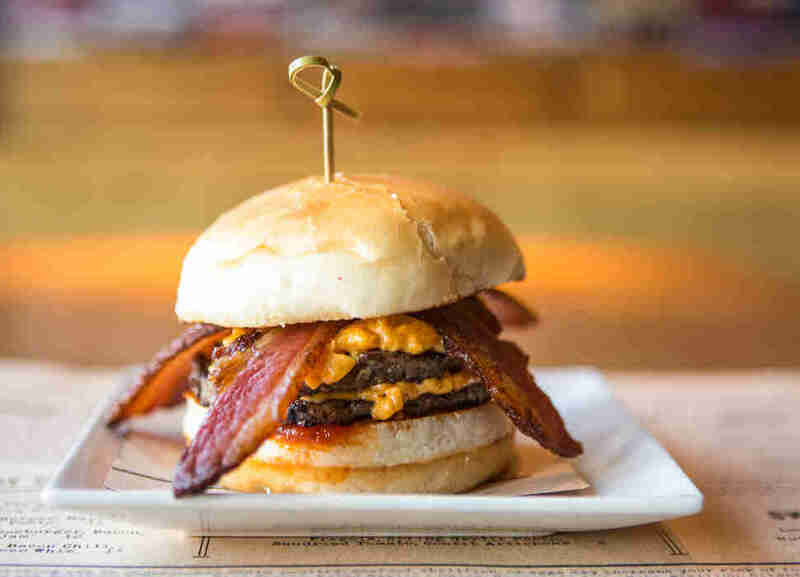 Follow along @ThrillistBurgerQuest, and use #ThrillistBurgerQuest to let Kevin know places he needs to hit. I almost didn’t go to DC. As I was planning out this trip, I never really thought of Cap City (does no one call it that? I really want to call it that) as a burger town. But I’m a fool. Upon further contemplation, of course it makes sense that DC is a burger town -- it is the ultimate lunch city. By the time I ended my trip, I realized that Cap City (it’s happening) might just be the most underrated burger city in the country. It’s that good. So how did I pick my places? Well, with help from Laura Hayes (former longtime Thrillist DC contributor and current Young & Hungry Food Editor at the Washington City Paper) and a few local chefs and other industry people, I narrowed the list down to eight burgers I could try within the 24 hours I was in the city. I also brought along my friend Ramsey because he grew up in Northern Virginia, and frankly I needed to someone to split all these burgers with me. 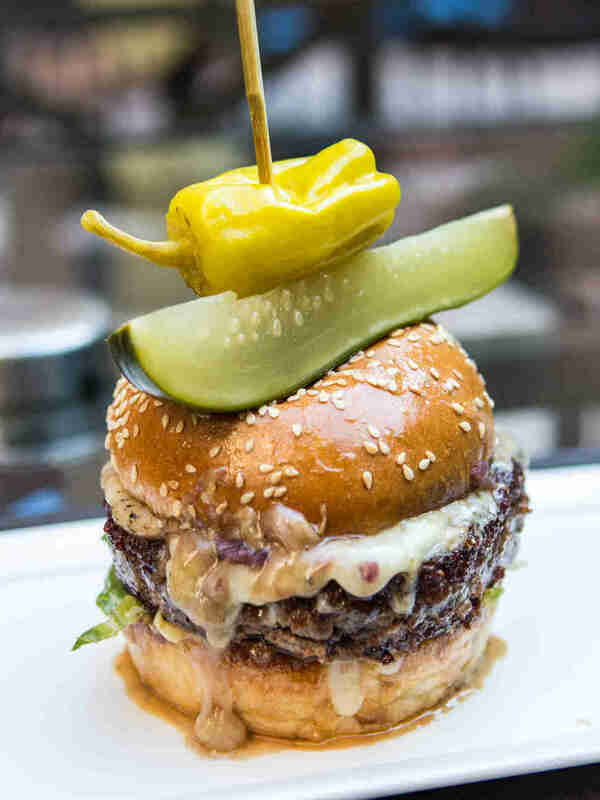 There was a time a year or two ago when legendary Chef Frank Ruta came to The Grill Room and tweaked the burger to possibly be (a version of) his famed burger from Palena and everyone cheered. The Post wrote stories breathlessly wondering if this Grill Room burger was a Palena clone, and everyone else speculated about the bun and the truffle cheese, and it was a crazy, heady time. And then Chef Ruta left last year and now everything is in flux, and I’m not even sure whose version of the Grill Room Burger I was eating. I was told that there is currently no head chef, and they are “in the process of hiring someone.” Many of the ingredients in the burger have stayed the same for years, but little tweaks (a potato bun now and Cheddar instead of truffled cheese) speak to separating the current version from Ruta’s. While I completely understand the need to do this, I also will say that this version needs some direction. The quality of the meat is there -- the grind was loose and had a good char -- but it was oversalted, undercooked, and bottom of the potato bun got soggy rather quickly. What used to be a strength -- the simplicity -- is now a weakness by showing off some inconsistencies. It’s still a formidable burger, but I think once they hire someone to take ownership, it’ll be in a better place. Because I am a masochist, in the middle of all this burger-eating I booked a dinner at Pineapple & Pearls, and my burger at Eatbar was the warm-up before said meal. So of course it was the most intense burger I ate in DC. There were many things to like about it: The bun was buttered and griddled perfectly, so it held up to the sloppiness of the cheese; and the spicy tomato jam added some nice heat and a bit of acid to the whole affair. My real beef (!) was with the pimento cheese itself, which -- having had it on burgers across the country -- is amazing for a bite or two and then just becomes this intensely salty condiment that overpowers any of the more subtle elements. I actually think just opting for a less aggressive cheese would do a lot here. Tap is one of the new(ish) wave of fast-casual burger joints with upscale ingredients taking over the land. And I have to say, its execution of what has come to be a standard template is well-done. The “custom blend of 30-day aged, naturally raised Local Harvest beef chuck and brisket” is salty with more funk than I was expecting from a fast-casual joint, and the grind is relatively relaxed. The bun is fresh and doesn’t get soggy. My two real criticisms are easily fixable: The burger was overcooked and was relatively dry by the third bite, and the caramelized onions were slightly underdone, giving them more of a bite than I’d expected. But all in all, this is a good burger, especially for the price point. Another contestant in the fast-casual-but-upscale burger world, Good Stuff plays a similar song about handcrafting local things from farms and apparently has a location in Saudi Arabia (one of only five total locations), so I was a bit suspicious walking in, but the GSE crew knows what they’re doing on the griddle. 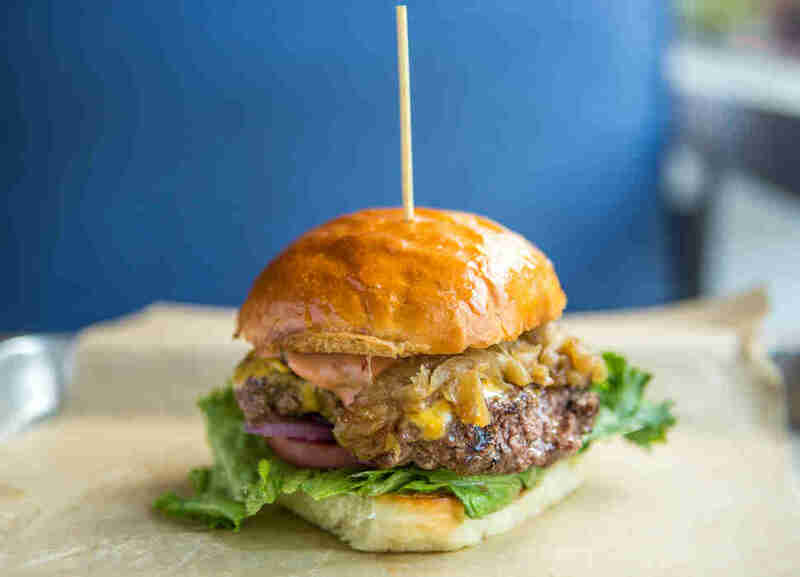 The Farmhouse cheeseburger smartly uses American for meltability; has a salty, perfectly medium patty; and is sandwiched on a “Pennsylvania Dutch” soft bun with a little sweetness. The other toppings (lettuce, tomato, red onion, pickles) were basic and unremarkable, and I thought that the “Good Stuff Sauce” lacked a real tang or enough acid to truly elevate and balance the burger’s meatiness out, but this is still a very good burger. When I was in DC it was a Thursday in late February, the temperature was in the high 70s, and everyone was freaking out. I met Laura Hayes and a few friends at Le Diplomate around 10pm as our last eating stop on the tour, and the place was mobbed. People outside eating Petit Plateaus of top neck clams and oysters, people inside eating moules frites and duck confit. People everywhere drinking carafes of blanc wines I’ve never heard of. It was quite the scene. As for the burger, the best way to describe it is likely “Fancy Big Mac.” It has the two patties (except these are a Pat LaFrieda blend), special sauce (except this version involves Heinz chili sauce and fresh mayo), no lettuce, glorious American cheese, pickles, and (red) onions on a sesame seed brioche bun. The meat had good flavor but was slightly snappier than I expected, and was perfectly cooked. I dislike the bulk of brioche buns, but this one was well griddled, with a nice buttery crunch that refused to get soggy. To be honest, if this burger existed in Philadelphia, it would’ve been my favorite in that city, but DC is chock full of great burgers, so it remains number four. C’est comme ça. I’d been to Ray’s before, but only the Arlington one, so I was very excited to found out there was a newer one in DC proper. When we walked into the K Street location, the place had the look of a 24 hour pop-up, with a menu taped up to the wall, and tables and chairs that looked like they’d been stolen from a hotel meeting room. I worried that this set-up might affect the quality of the burger. I needn’t have worried. 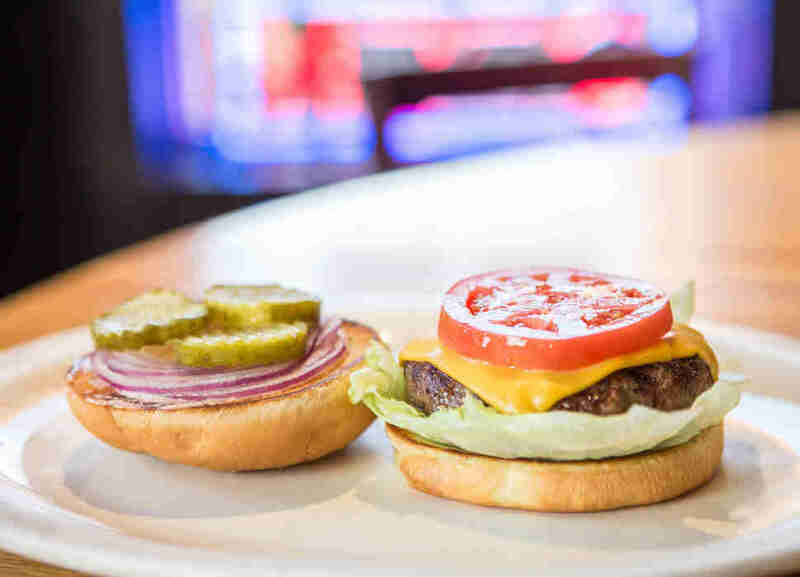 The meat in Ray’s burgers is legendary, aged, hand-trimmed, and custom ground from Ray’s The Steaks. The simple Mack version was as basic as they come, and yet the entire composition of the burger was nearly perfect, with the lettuce and tomato stacked on the bottom, and the messy stuff, like the awesome sauce, pickles, cheese, and onion, on top. The burger was slightly underdone (that pink was looking more like a deep red in the middle) but the taste and quality was so high, I could’ve eaten it as tartare and probably would’ve been happy. The restaurant scene inside Four Seasons hotels tends to be hilarious. Most of the clientele belongs in the category of rich that doesn’t even break a sweat spending $40 on a tater tot and foie gras poutine appetizer (yes, that’s really on the menu). Because I’m a great friend, I listened to Ramsey and kept quiet as we sat at the bar and ordered the steak burger to split (like true ballers!). But once the burger came, I could no longer stop talking. Much like Le Diplomate, this has all the makings of a fancy Big Mac. It was immaculately composed, but with the clothbound Cheddar on the bottom. The meat was so salty and well-cooked, I felt like someone had actually chewed up a delicious steak and then baby bird-ed it back into a patty and grilled it, and if you think that sounds gross TOO BAD FOR YOU. This burger is a revelation, and at $19, it might be the most affordable way for you to watch people with jets eat poutine. Win-win. This was the first place Ramsey and I went when we got to DC. We sat outside in the intense sunlight, ordered beers and some absolutely delicious Mexican corn special, and the proper burger. Duke’s is British, I gathered, because it shortens words and add “ie” to the end of them, like “brekkie,” and also sells black pudding. But never mind that! Let’s talk about this burger. Dear God, friends, this burger is a near-religious experience. Seriously, I wanted to stretch my arms out in benediction as I was eating it, and I’m kind of a Christmas-Easter type of Christian. If you’d like details, I can provide details: the Creekstone Farms Angus double burger has an impeccable loose grind and is cooked to a perfect medium. The house dill pickles, pickled onion, and sweet chili sauce provide the perfect acid balance for the Gouda, garlic mayo, and meat. The bun is soft and toasty and stays the hell out of the way. 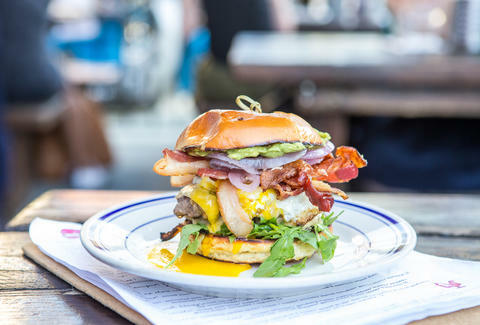 The menu lets you add all sorts of tricks to the burger, like a runny egg, bacon, or even truffle oil. Resist the temptations. 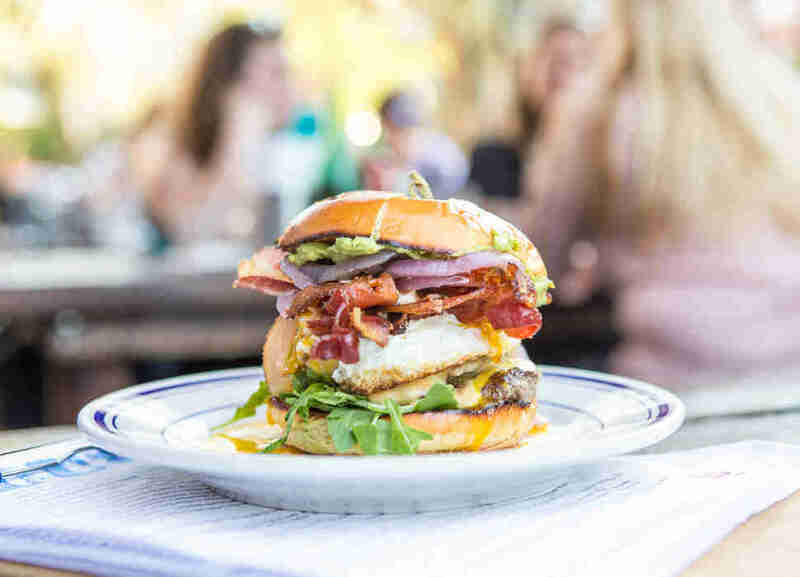 The Proper Burger at Duke’s Grocery is perfect as is, and easily one of the 10 best burgers in America. Amen. Kevin Alexander is Thrillist’s National Writer-at-Large, chief burger critic, and staunchest advocate of pickled onions. Follow him to Twitter/freedom @KAlexander03.